Issues surrounding leaking oil tanks, describes oil tank inspection and tank testing methods, suggests what a home owner or home inspector is obligated to do and report if an oil leak is found. This article also provides links to more detail about above ground and buried oil and other storage tanks. Leaking oil tanks are not only a concern as contaminants of the water supply, but have become an increasing general environmental concern addressed by the DEC. Leaking commercial equipment and even simply-suspect equipment have been extremely costly to address. Such burdens were never anticipated when the equipment was installed. While similar regulations pertaining to residential installations are scarce, this topic is of growing concern to home owners and home buyers. This article explores opinions and suggestions culled from news articles, discussions in several states and provinces, and discussions among several home inspectors. Back in 1961, traditional heating oil tank installation procedures and standards recommended that all oil-storage tanks be buried outside wherever feasible. That was then. This is now. In states where oil is used for residential space and water heaters, oil storage tanks are found buried outside (550 or 1080 gallons), outside above ground (often a 275-gallon "indoor" tank never intended for weather exposure), and inside (275 to 550 gallons maximum). Leaks at any of these tanks are at risk of causing environmental damage. In one older property we found an indoor tank leaking directly into the casing of a private well which was located in the basement! New York State's Department of Environmental Conservation has been developing and enforcing a Petroleum Bulk Storage Program since the early 1980's. The goal of this program is to prevent leaks and spills of petroleum into the environment. The New York State DEC estimates that there may be as many as 185,000 above and underground tanks storing petroleum in New York State subject to DEC regulations. Many of the tanks installed in the 1950's and 60's are bare steel and have a fifty percent chance of developing leaks today. The regulations require that these facilities must be registered with the state. Depending on the size, age, location, and type of product stored the system may have to be upgraded or tested. In New England for a two year period [1984-5] among customers who have buried heating oil tanks (16% of total customers or one buried oil tank per 10,000 oil heat customers) surveyors found an average of 1.7 tank leaks per thousand customers. A study of 500 underground fuel storage tanks was completed for the U.S. EPA and studied tanks on Long Island in New York in 1988. See "[Fuel Storage] Tank Corrosion Study", U.S. EPA report on gasoline and oil tank corrosion, November 1988. Of those 500 storage tanks about half were used for gasoline storage and about one fourth were used for home heating oil storage. But significantly the underground storage tank leak rate did not depend on what fuel was being stored. More recent oil tank leak data scan be difficult to obtain, but the two articles below provide additional detail and specifics. OIL TANK FAILURE RATES gives details and statistics about the chances that an oil tank or oil tank piping system is leaking or about to leak or has already leaked. ABOVE GROUND OIL TANK INSPECTIONS discusses the visual inspection of above ground tanks for evidence of leaks or other defects. OIL TANK PIPING & PIPING DEFECTS discusses the causes & frequency of occurence of types of leaks in oil tank fill, vent & distribution piping. Heck reported that 82% of leaks at petroleum product storage tanks (n=240) were in the piping system! Underground fuel storage tanks usually fail from rust perforation due to several effects of water inside the tank including, in the case of heating oil, combination of water with sulphur in the fuel. External rust, unless very heavy, isn't highly correlated with internal rust. A new tank can involve significant expense. 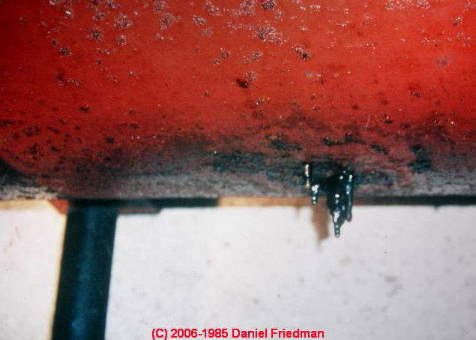 Oil tank leaks are also caused by mechanical damage during installation,oil fill, vent, or supply piping errors, corrosive soil conditions, possibly by oil tank manufacturing defects, possibly indirectly, by weather conditions and in-tank condensation, and finally, by delivery of bad oil that contains excessive amounts of water. OIL TANK FAILURE CAUSES gives details about the causes of oil tank leaks and oil piping leaks. 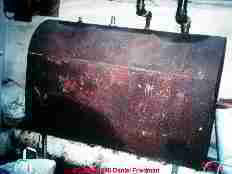 OIL TANK ABANDONING PROCEDURE discusses the requirements for abandoning or removing oil tanks. If a tank is leaking its use will have to stop and an oil spill cleanup performed. Oil tank leaks must be reported, as discussed below at WHAT IF AN OIL TANK IS LEAKING? The U.S. Department of Environmental Conservation has a program registering buried tanks at any site storing more than 1100 gallons of heating oil. Requirements for gas (auto fuel), or other fuels may be different. Eventually this concern may spread to smaller residential tanks. The concern is for leaks which contaminate the environment. Oil storage tanks located where they may leak into a local waterway or into the water supply are a special environmental concerns. Free publications are available from New York DEC regional offices: Petroleum Storage Regulations, How to Register Your Petroleum Storage Facility, Testing Underground Storage Tanks. A New York Help-line number is also available at 1-800-242-4351. Oil Tank Leak Actual Environmental Impact & Leak Regulations: How are we affected by oil tank regulations? On-site oil storage capacity can require tank registration: It is not unusual for a homeowner in the Northeastern U.S. to have installed additional storage tanks during the energy crisis of the 1970. The added storage can bring the capacity of the property above the 1,100 gallon threshold and under the DEC regulations. Many older homes with underground steel tanks have a good chance of developing a leak. We should provide our clients with this information. They can then make an informed decision to seek additional data and can also decide if testing should be performed. A leaking above ground oil tank may be discovered by simple visual observation. Leaks in buried tanks require special testing methods to locate and then test the tank for leaks or the soil for past leakage. If you see a leaky oil tank or an oil spill: In New York (and in most other jurisdictions) anyone visually inspecting a petroleum storage tank of any size and finding that the system is leaking must report the leak to state environmental authorities. In New York State an oil leak must be reported within two hours to New York DEC. The New York Oil spill hotline is 1-800-457-6362. For other states see the state contact information listed at OIL TANK REGULATIONS. Buried fuel tanks should be tested for amount of water present in tank bottom, and any water should be pumped out. Water corrodes the tank and leads to leaks. So if there is a lot of water in the tank we are more concerned about the chances that inside-tank corrosion is severe and there is a greater risk of tank leaks. While we've found them lasting longer, a common life expectancy of buried oil tanks is 10-15 years. We do not have the same data for gas tanks. Life may be similar. If the tank is to remain in use, ask your fuel supplier about using an additive or other methods to help remove water. What should a home inspector report to a client about buried oil storage tanks? A buried oil storage tank is installed at this property. Such components are not inspected (tested) during a home or building inspection unless specific prior test arrangements have been made for advice by an appropriate expert. Watch out: if an oil storage tank has leaked and not been properly cleaned-up or if the tank has not been properly-abandoned there is risk of significant cost to the property owner as well as risk of serioius environmental contamination. In most jurisdictions reporting of oil tank leaks and oil tank removal or abandonment are regulated by law. Continue reading at OIL LINE PIPING LEAKS or select a topic from closely-related articles below, or see our complete INDEX to RELATED ARTICLES below. Or see OIL TANK LEAK & SMELL FAQs - questions & answers posted originally at this page. OIL TANK LEAKS & SMELLS at InspectApedia.com - online encyclopedia of building & environmental inspection, testing, diagnosis, repair, & problem prevention advice. Thanks to Arlene Puentes for for technical edits on oil tank leak advice- 12/2005. Arlene Puentes is a licensed home inspector, educator, and building failures researcher in Kingston, NY. In September 1986, a precision tank testing program was started to bring a major Maryland utility into compliance with the State of Maryland Oil Spill Control Regulations regarding underground storage tanks. This program involved the testing of over 240 tanks ranging in size from 300 gallons to 1,500 gallons located throughout the entire state of Maryland. Analyses of the testing results revealed that 40% of the systems tested leaked. Piping leaks caused 82% of the testing failures and tank leaks caused the remaining 18%. Tank systems located in urban areas experienced a 50% testing failure rate, while tank systems located in rural areas experienced only a 25% failure rate. Leaks in tank systems in urban areas appear to be the result of structural loading and corrosion, affects [effects] absent in rural areas. The age, capacity, and usage of the tanks did not have a role in causing leaks either in the piping or the tank.